47 Laboratory Gaincard Amplifier & "Power Humpty"
Product: 47 Lab Gaincard amp and Power Humpty power supply. The world of hi-end amplifiers is getting a little predictable. It's generally easy to categorize a given amp. There's the "muscle amp", a transistor monster with massive power supplies weighing as much as a mini and with a 10mm thick frontplate. The equally chunky transistor class "A" job, which matches the muscle in everything but "paper" watts. Then there's the valve brigade, either in glowing push-pull mode, or the "holy grail" a single ended job with a bakers dozen of watts, massive transformers and a milk bottle sized valve "lighting up the darkness". The Gaincard isn't like that. Like so much interesting hi-fi it's the brainchild of one man - Junji Kimura. It also comes with the obligatory philosophy course such products need... It's a small, unassuming thing the size of two cigarette packets. Exquisitely made of just a front and back plate in black CNC machined alloy. Between them lie the two cigarette packet sized aluminium extrusions, each containing a complete monoblock power amp. Many amps claim to be "dual mono". In my book that means you could take a hacksaw to the thing, split it in two and it'd still work. The Gaincard is such an amp. Yes this is the most oddball transistor amp I've yet seen. Actually there's a cheat here as offboard there's a beautifully machined, barrel shaped power supply. The "Power Humpty" (what?) is shared between channels but can be doubled up to give true monoblock operation - at a price. It's rated at 170va about what you find in a decent 200 pound integrated, but it's the quality of the transformer and regulation that matter. So why the tiniest power amp on the planet? Well the thinking is that by making the amp simple and very small, signal paths, particulary the feedback loop, are very, very short. I suppose at this stage I'd call it "honours even" with a slight bias towards my preference for dynamic kit. So a decent review would follow. Well first no component gets a good review just 'cos the world likes it, but I knew there just had to be more to come. I contacted Sakura Systems the US distributor, because I suspected first that speaker cables might be critical, particularly considering the odd connections. Secondly I wanted to play around with speakers. So a couple of weeks later some Storatos cable arrived and like everything else from Lab 47 it was weird. It consists of very pure copper, a single 0.4mm strand surrounded in some hard plastic insulation. The copper is very brittle and of course each speaker requires two of these to make a run - the strands being completely separate. And here an apology. If the Gaincard was designed with these cables in mind and surely it was, then those binding bolts are the perfect connection, squeezing the one strand directly onto the wire coming from the power amp - perfect and minimalist. This cable tightened the bass up a little and actually improved the extension, but I still thought it a little "polite" for my tastes. The IPL's are a pretty easy load, transmission lines tend to be and my Audion was quite happy driving them on the 8 ohm tap. But they are only about 87 dbl efficient. Don't get me wrong, the Gaincard managed to get them to party level, it just didn't get them to boogie :-) Here a big thanks to Cabasse who had left their Sloops with me on long term test. I don't use these normally because I miss the slam of the IPL's when it comes to rock music. They are better than the IPL's in many areas, but in the end I'm an ageing "rocker"... One thing they do spectacularly well is produce volume for watts. The Sloops are 94.5 dbl efficient, and that is a true figure rather than the usual wishful thinking some manufacturers indulge in. To put that into perspective it means you can have a party with 5 watts. So I wired them up. Something went "click"... Over the next three days as the Gaincard warmed up it just got better and better. Here it started to make me feel that the Audions were subtly manipulating the music. Where the Audions seemed to be putting a warm glow over everything the Gaincard seemed to be leaving everything untouched. A lowered noise floor, that darkness behind the music, became more apparent. At times it made the Audion sound just a bit uncouth. On the other hand that boogie factor had arrived in spades, the timing on tricky tracks like "Los Lobos" "Be Still" dropping into place. Bass lines became lightening fast. The bass notes in Dire Strait's "Ride across the River" stopped like they'd hit a wall, the "drop out" on "Hotel California" became a chasm. Then the detail. As always it's multi-tracked vocal that benefits most. That extra backing singer, the half heard harmony that suddenly leaps out at you so clearly you can sing along. On "Simply Red's" "Sad Old Red" the cymbal and hi-hat that run through the song shimmered and decayed in a natural way, then changed character as the song steps up a gear half-way through. All the time that lovely fruity bassline pulling the music along. The combination was very good, good enough to match the Audion/IPL combo in my affections. The remaining problem was really down to a rather dry, mid forward balance. This I didn't blame on the Gaincard, it's a characteristic of the Sloops, though my favorite cartridge the recently retipped AT 33e is bright and pushy. Someone up there must be on Lab 47's side (and mine) because in the last week I had the amp, a parcel arrived at chez nous. In it was the long promised return of the Dynavector XV-1 for long term test. If you want to know how good this cartridge is read my review, but suffice to say I've not heard anything as good. More to the point it is a immensely powerful big sounding cartridge. At a stroke the system gained the balance it had lacked. Female vocals took on a realistic body, a warmth that I consider natural returned. Sade's voice on "Your love is King" was warm and breathy, standing out plainly in front of the band, but you could tell she had "no voice" - in an acoustic age she'd never have made it. The Sax had body and power but you could hear the dampness of the reed. A double bass isn't just a string vibrating, it's a big reverberent wooden box - listening to "Take Five" that's exactly what you got. Here I was getting the best sound I've ever heard in my home - even if it lacked the ultimate "slam" of the Audion IPL set-up. The system seemed to get the best out of every disc, it wasn't like a "Sword of Damocles" waiting to strike down poor recordings. Take Madonna for example. "Ray of Light" gets my vote for being the "Recording-Most-Likely-to-Have-Been-Made-Through-a-Sock". Then another box arrived a day later. A pair of the new Euroacoustic EH-140's (review to follow). These are big two-way floorstanders of about 87 dbl efficiency. Wiring them up the Gaincard went a bit "polite" again... The Audions gleefully pulled their trick of kicking them into life just as with the IPL's. Again it wasn't a question of loudness, just that the Audions managed to inject fire into proceedings. Here I'll put up my own theory... I think the Gaincard is not biased towards class "A" - anything that changes it's temperature only by a fraction cannot be. But I think that a few, perhaps even one or two watts are class "A" and that these are some of the best watts in the business regardless of cost. The other 23 or so are there to party with when ultimate quality isn't so important. A speaker like the Cabasse will rarely need more than those two watts, others will draw on the "second team" more often. At it's best it is just stunningly transparent but it needs careful partnering to fulfill its potential. This has been a long review so I'll try to get to the point. Within its favoured "envelope" The Lab 47 Gaincard is the nearest thing to the "length of wire with gain" ideal that I've ever heard. But it is not an all-rounder. Anyone buying this amp and using it with unsuitable speakers will wonder what the hype was about. It'll sound good, but not great. What's unsuitable? I suspect that though the Gaincard will drive moderately efficient speakers quite happly, it really needs very efficient speakers to spread it's wings. I only had the Cabasses to hand, but coupled with a meaty front end I think they're a match made in heaven. Something like Klipsch or one of the better horns might be worth trying. Here you are going to have to rely on your dealer's knowledge and trust them and your ears. They will have favourites of their own and I hope more knowledge than I on how to get the best from the beast, though high efficiency speakers tend to be bass light. Where does that leave me? The Gaincard may not look good value for money from a distance, but right now it sounds a bargain and I'd dearly love to keep it. Giving up the Gaincard and it's capabilities is desperately hard, but in the final analysis I can't afford two amps and the Audions are just better all-rounders. In writing for TNT I have to have kit that biases test results as little as possible and to be fair to the Audions they don't lag that far behind the Gaincard even with the Sloops. 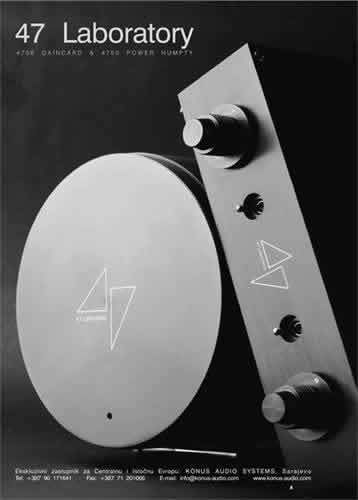 It is my pleasure that TNT got the chance to have 47Laboratory Gaincard amplifier on review among the first in Europe. It is my strong opinion that the independent audio journalism needs support from audio industry and for me, it was no question whether or not to meet the request that we got from you for a review of our amplifier. Contrary to many other high-end brands, we try not to make an aura around 47Laboratory products. We are happy to let people hear it and hopefully capture some of the excitement that goes with such experience and which all of our customers share with us on a daily basis, together with passion that evolves from the first time excitement. Having 47Laboratory Gaincard reviewed by TNT was a challenge. Gaincard comes to Europe with an exceptional reputation in Japan and, these days, in USA. It is never an easy task to get yet another positive review, regardless of how easy that might look. People expect miracles and the criteria gets tougher and tougher and, sometimes even real miracles slide out of perception. It is a normal psychological thing and passing such criteria with stellar comments is very much rewarding. Indeed, I find your review very positive and I am very pleased that you've managed to recognise some of the beauty Gaincard has to offer. I am glad you've enjoyed it. When sending me the draft review, you asked me to be critical about it. Why? I don't see any reason to be critical to a fair and honest review! My understanding is that Werner will make a second opinion review on Gaincard and I am very confident to say in advance that I'm sure it will have all the honesty one can look for, too! It is exciting and very positive thing to have views on the same products from different perspectives, oftenly opposed preferences, tastes and priorities and not from the perspective of the ultimate authority as such doesn't exist. I understand your concern about Gaincard's ability to drive speakers of medium efficiency. I guess that very much depends on the room size. Some of the best sounding setups with Gaincard are with high and, surprisingly, medium efficiency speakers. Still, for the difficult loads (much more in the terms of impedance instability than lower sensitivity), as of April 5th, there is more powerful, 50W version of Gaincard available and we hope it will expand further, already quite long list of speakers that we've found Gaincard to be compatible with, or, allow me to use your words, with whom Gaincard makes "click". It comes not as replacement to existing 25W version Gaincard but as an "reinforcement" to 47Laboratory line of products. At the end, I would like to emphasise the issue that you've mentioned in your review - the importance of audio dealer knowledge as the factor of crucial importance in helping customers in selecting audio systems that will suit their needs and passion for music. What makes a good dealer is knowledge and committment. 47Laboratory, being well aware of that fact, is quite selective, both in terms of distributor and dealer selection - we strongly believe that any brand with non-plus-ultra aspirations owes equally good treatment to their customers. I wish you and all at TNT the best in your future work.